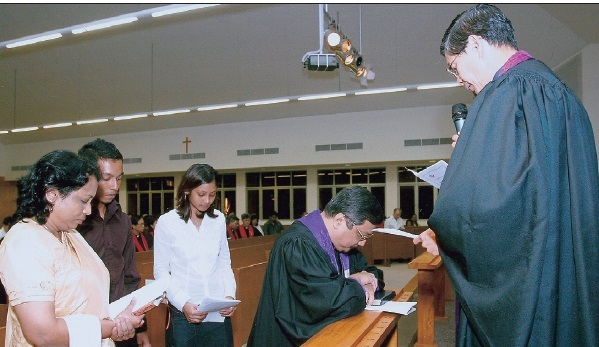 CARRYING on an annual tradition, the National Council of Churches of Singapore (NCCS) held a Thanksgiving Service on Aug 14, 2006 to mark Singapore’s 41st National Day. 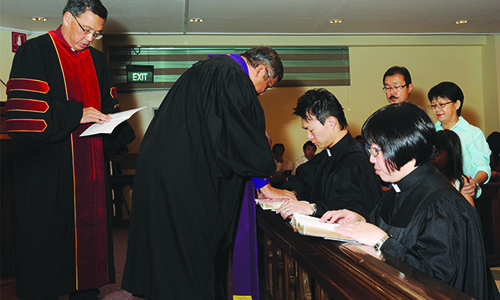 The congregation in the New Sanctuary of St Andrew’s Cathedral was joined by a number of political leaders who included Mr Teo Chee Hean, the Minister for Defence, Associate Professor Ho Peng Kee, Senior Minister of State for Home Affairs, Mrs Lim Hwee Hua, Minister of State for Finance, and Dr Ong Chit Chung, Member of Parliament. Anglican style, with a processional backed by an introit sung by the Wesley Singers. What a stirring sight it was to witness the train of bishops, moderators and heads of churches and leaders of the Bible Society of Singapore and Evangelical Fellowship of Singapore (EFOS) in reverent approach towards the altar! Following the call to worship by Archbishop John Chew, anthems of praise and worship were successively rendered by various groups and choirs. The Voices of Praise sang a song in Chinese while a group from the Ang Mo Kio Tamil Methodist Church gave a tribute in Tamil to the accompaniment of traditional Indian musical instruments. Later in the service, The Crosswind and The Next Generation presented a beautiful medley and a dance, respectively. Major Andy Lim of The Salvation Army, Singapore; and the Rev Dr Patrick Lau, General Superintendent of the Assemblies of God Singapore; each took turns to lead the people in prayers of thanksgiving and specific petitions. Urged by the Rev Canon Kuan Kim Seng, Vicar of St Andrew’s Cathedral, the congregation spent minutes in silent prayers for families and loved ones, neighbours, friends and colleagues. 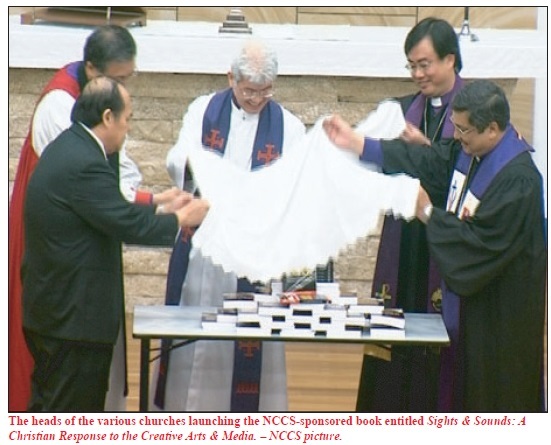 The sermon by Bishop Dr Robert Solomon, President of the NCCS and head of The Methodist Church in Singapore, was a passionate call to acknowledge God as the source of the blessings the nation enjoys. While the bishop, who was speaking in his capacity as President of the NCCS, attributed the success of Singapore to “the hard work of our fathers and mothers, and the able and astute leadership of the Government”, he reminded all that behind the achievements was God’s grace. His sermon, entitled “God’s Gifts to the Nation”, referred to “our little nation” as one of God’s miracles. Hence, he said, it was important to acknowledge God and thank Him. The sermon was based on the Scripture text from Psalm 127, which deals with building, security and family life – three key concerns of any nation, said the bishop. Conserving what is created is also an important task. We have become vulnerable. Terrorism is one threat that has not gone away. Deadly epidemics, such as the bird flu, Sars and natural disasters, are another threat. We are thankful for a diligent and foresighted government that has taken measures. But beyond all this, we are dependent on God – “God is our Security”. The bishop pointed out that the second half of the psalm talks about the fabric of the nation – strong families and a well-prepared younger generation. Here, too, God is behind it all. Building our future, based on the next generation, is an enterprise that must be led by God. Healthy family life must be preserved. The Church has done much to contribute to nation-building, and it must continue to do so. Said Bishop Dr Solomon: “There are many Christians in public service. There are volunteers in the community. They are all helping to preserve values. We can do our part for security too. Live peacefully with our neighbours, and build relationships. Family life must be strengthened. 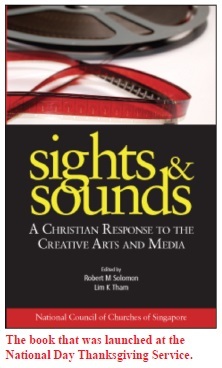 Following the sermon, the heads of churches united in launching a new NCCS-sponsored book entitled Sights & Sounds: A Christian Response to the Creative Arts & Media. They then presented a copy to the Minister for Defence and the other political leaders who had witnessed the launch. Few books are accorded such ecclesiastical and regal honour. When the service ended, there was a sense of exhilaration as many felt ministered by the word and worship. 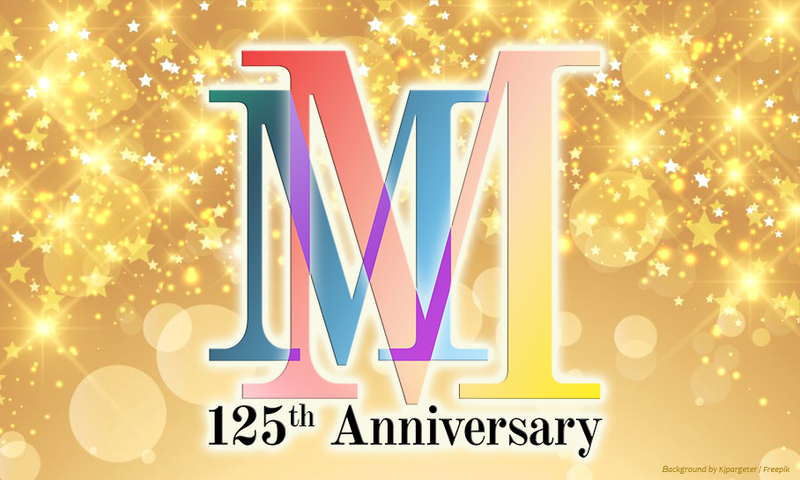 Many of us are looking forward to the service next year. 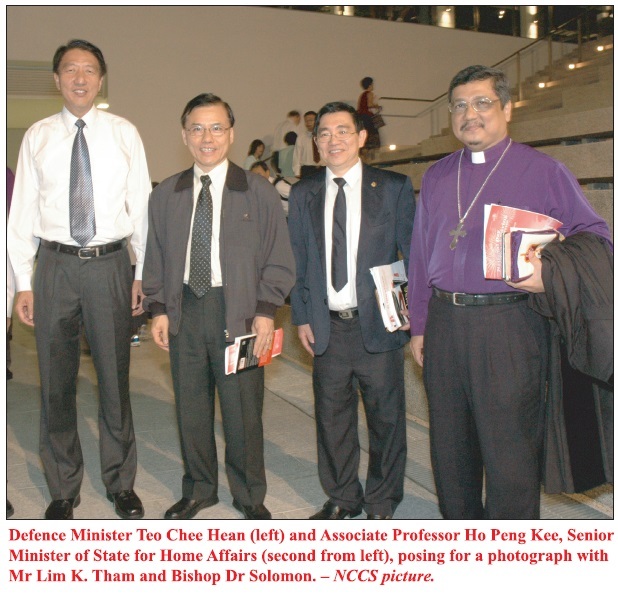 Lim K. Tham, a member of Fairfield Methodist Church, is the General Secretary of the National Council of Churches of Singapore.